I’ll cover each of these as we progress through the 5 days. I also recommend the regular LCA Blogs by Rodger Donaldson and Simon Lyall, in addition to Jonathan Corbet’s excellent content on LWN. 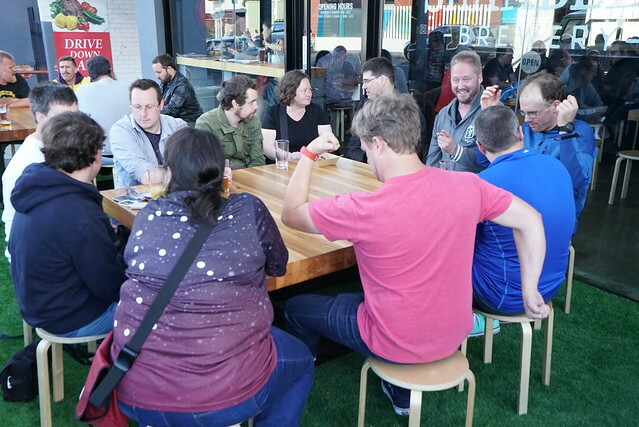 Aside from a chance to complete registration early, and catch up with old friends, there is a bit of a linux.conf.au tradition that a newbie introduction session, plus a speaker briefing, are held on the Sunday afternoon before the conference. Historically Rusty Russell ran the newbie session but for a second year Hugh Blemings (the outgoing Linux Australia President) stepped in with assistance from myself, Michael Davies and Rikki Endsley. Afterwards we adjured to a watering hole in the Salamanca area of Hobart to socialise with some of the new attendees. As a former conference organiser for LCA 2015 in Auckland I also had the chance to catch up with “The Ghosts of Conferences Past” at another “undisclosed” location. With a interesting break from tradition ahead of the conference opening Professional Delegates and Speakers were invited to a “Networking Breakfast”. A hot breakfast with a suitable consumption of caffeine appeared to invigorate many of the attendees, and guaranteed that we arrived at the opening on time. In addition it provided a chance for IBM and HPe, the Emperor Penguin Sponsors, to say a few words to the crowd. A second major change for 2017 is the catered lunch break. To keep costs down LCA has traditional covered morning and afternoon tea, but given the location of the conference venue catering lunch made a lot of sense and provided an additional opportunity to network with other delegates. The conference opening by Chris Neugebauer covered the usual LCA history plus some of the 2017 social events and changes. In addition Outreachy was named as recipient of this years fund raising, and provided a chance for Karen Sandler (see right) to speak about their FOSS intern-ship program. The conference team was aiming to raise AU$ 9000 to fund an Outreachy intern and their mentor. Our location for the 2016 conference was the Wrest Point Convention Centre which provides some spectacular views. After the break the conference split into 6 mini-conf streams. I personally split most of my time between System Administration and Open Knowledge miniconfs. Many thanks to Matthew Cengia for running the Open Knowledge miniconf and providing me a chance facilitate a discussion on how we can better promote an open agenda within communities and organisations. As usual Ewan and Simon put on an excellent Sys Admin program in their room. A few of my own highlights of talks from the Monday. 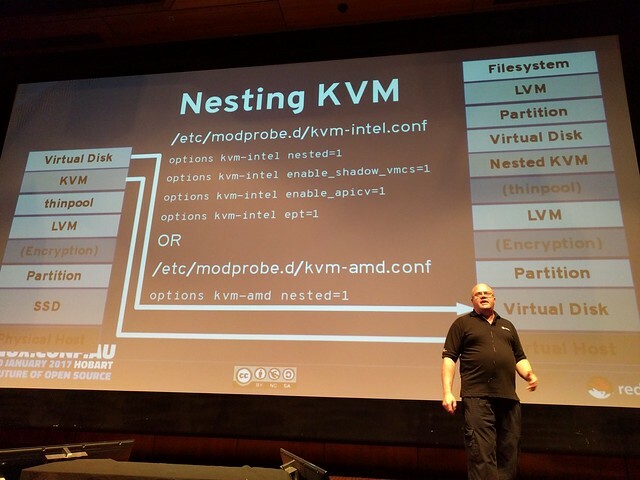 Tom Eastman (see right) covered the challenges of creating a safe virtual appliance that Ko-ordinates could provide to their end customers under The Opposite of the Cloud (video). 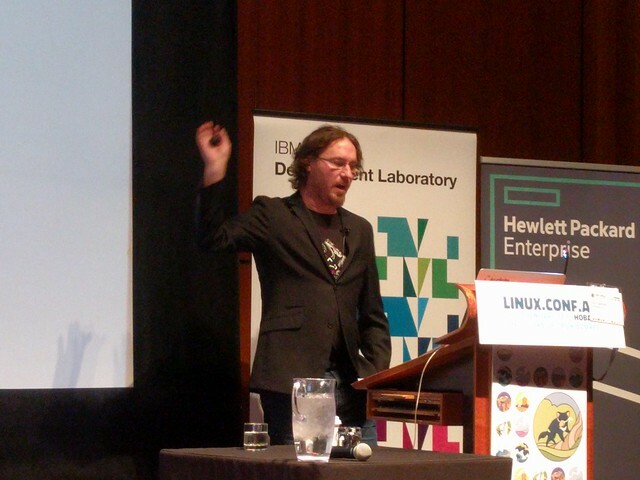 Steven Pousty always provides energetic sessions and mashed up his love of bird watching with how to do interesting thing with Open Data thanks to containers and OpenShift – Building My Own Little World with Open Data (video). Andrew Bartlett, a regular conference speaker on Samba technologies, covered some of their challenges in performance tuning for large environments – Samba and the road to 100k users (video). Plus a mention for my own sessions from Monday. I do have to give a special mention Katie McLaughlin and her team for putting on WOOTconf, and scheduling a wonderfully diverse range of speakers and topics. Sadly the only session I caught in person was Rikki Endsley‘s talk that closed WOOTconf, and should be compulsory watching for all hiring manages working in IT today. 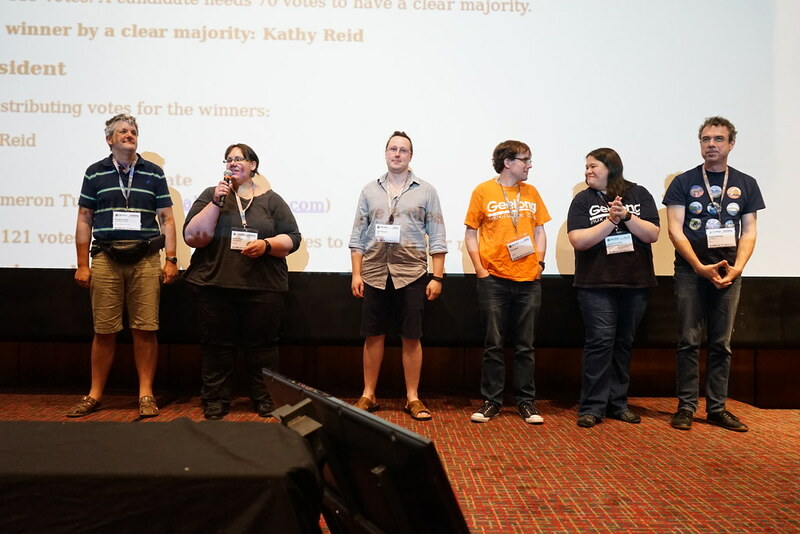 Monday closed with the Linux Australia AGM, where Kathy Reid became the latest female president of the organization. Afterwards I headed to the “Watermans Beer Market” for a catch up with some of the Red Hatter’s present at this years conference. We had a great mix of people from from across the ANZ region, plus visitors from the US and Singapore. This included representation from Engineering, Support, Sales, Legal and Community. We had a couple of apologies, but overall an excellent turnout.